Apple and Samsung have the highest share of their users actively using two or more of their devices. This is based on the MetaFacts TUP (Technology User Profile) 2018 survey results. Among online adults in the US, more of Apple’s and Samsung’s users have two or more of the brand’s devices than only use one of their devices. 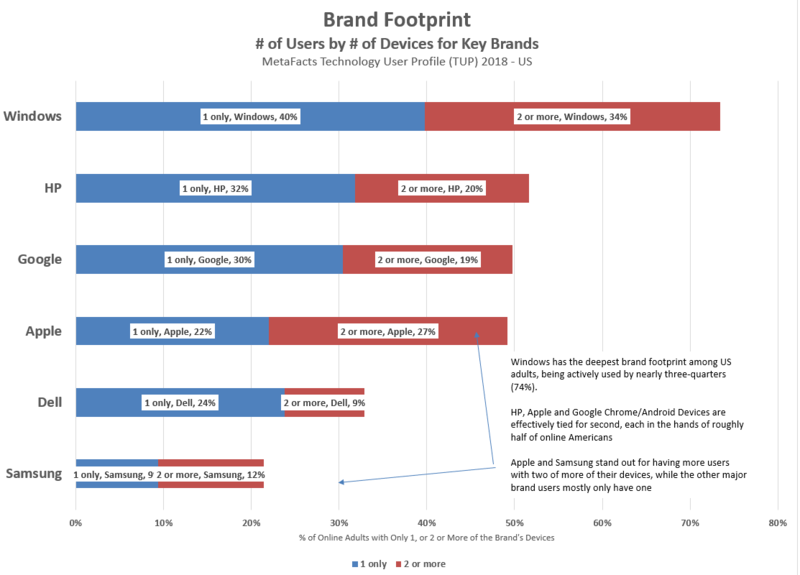 Although brand footprint is an important measure in its simplest form – market penetration by the percent using at least one of a given product – the multi-device measure goes deeper. It shows the extra commitment customers are willing to make towards using any particular brand or ecosystem. In a pragmatic way, it reflects the value they place on a brand. Based on the simple brand footprint measure, Windows devices have the deepest market penetration. Effectively three in four (74%) online Americans are using one. In a near three-way tie for second place, HP, Apple, and Google OS products are being used by nearly half of all US online adults. While HP has a slightly deeper footprint than the other two, with 52% of online Americans using an HP PC or printer, Apple and Google (Chrome/Android) are each in the hands of 49% of online American adults. There’s also an overlap of Apple’s and Google’s best customers, with Apple having the stronger position. One in eight (12%) of adults with two or more Google OS products also have two or more Apple devices. One in twelve (8%) of adults with two or more Apple products also have two or more Google OS devices. The analysis in this TUPdate is based on results drawn from the most-recent wave of TUP (Technology User Profile), the 2018 edition which is TUP’s 36th continuous wave. This survey-based study details the use of technology products by a carefully-selected and weighted set of respondents drawn to represent online adults. This recent wave spanned the US, UK, Germany, India, and China. For this TUPdate we focused on users in the US. Google Android and Chrome OS Tablets and Smartphones have taken the world by storm, and yet aren’t for everybody. Five US states have the lowest use of any Google Android/Chrome OS device: Ohio, California, Illinois, Pennsylvania, and New Jersey. Nearly one in six (65%) of Connected Adults in New Jersey do not have an Android or Chrome OS Tablet, Smartphone or Chromebook. Fifth-ranked California has 58% of its Connected Adults not using any. In the classical analysis of technology adoption, there are innovators, early adopters and laggards. Although often ignored or derided, there are also avoiders. These are the people who go out of their way to not use something. Although some tech forecasters may assume that eventually 100% of the population will use a given product or service, that’s hardly ever the case. In the case of Google-avoiders, not all of these are avoiding Smartphones or Tablets. In our TUP 2016 survey, we found that a substantial number of Google-Avoiders use a Tablet or Smartphone running Windows or Apple iOS. Many other related answers are part of the full TUP service, available to paid subscribers. The TUP chapter with the most information about Google-avoiders, Apple-avoiders, and Windows-avoiders across all devices and platforms is the TUP 2016 Devices Chapter, and within that chapter, the Device OS Ecosystems section.